I have had some questions concerning the campaign here at the store and after reading the campaign kit thoroughly, I wanted to publish this to make everything clear as to how the campaign and prizes will be awarded. Mishap Games Kill Team Campaign RULES! If a customer has a Built Kill Team or Painted Kill Team, they can add one resource point to any of the four resources before playing a game! The campaign runs for 12 weeks (split into 3 months) and you can play with multiple Kill Teams. To compete for monthly prizes, participants must have 4 stamps at the end of month 1 (Oct 20th), 8 stamps at the end of month 2 (NOV 24th) ,12 Stamps at the end of month 3 (Dec 22nd). Participation awards are given for the number of games played. Players cannot record more than 4 games by the end of the first month, 8 games by the end of the second month, or 12 games by the end of the third month. Earn a Stamp on your Campaign Card for every game played to record battles fought and updating the Resource boxes on the front of the card. 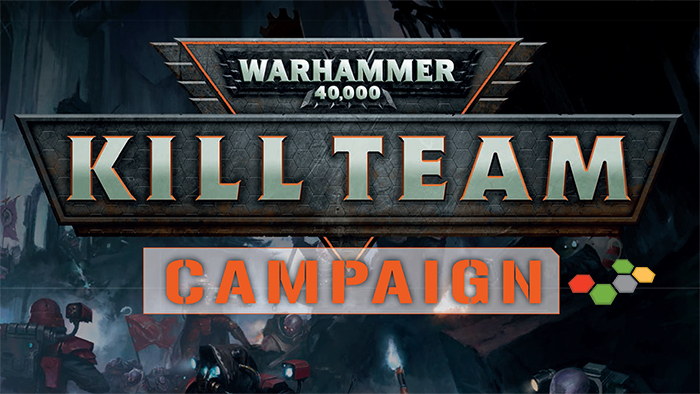 After Campaign Card is stamped 4 times, players earn a Veteran Campaign Card for that team, a Kill Team button, and a Kill Team Point Tracker (use it for command points and victory points). One for the end of each month (Bronze month 1, Silver month 2 and Gold month 3), to reward the overall best Kill Team at the end of each month.Totals of all the resources on the front of the customer’s Campaign Cards will be added up and compared. The customer with the highest score is the monthly winner. One button badge for each month (Bronze rim month 1, Silver rim month 2 and Gold rim month 3). For each of the 16 factions – work out which customer has the best score (as above) and present the customer with their pin badge. Kill Team Guerrilla Stickers: If any of the four boxes, which represent different campaign resources on the front of the customers Campaign Card go to zero the customer becomes a Guerrilla. They can no longer score in the campaign but they can still fight to knock other Kill Teams out too. Remember: These customers can (and should) still play and win Dice and Objective Counter prizes if they keep playing the campaign… they can also be the best Guerrilla! We want to reward customers who stick with you all the way through the campaign… even when they are knocked out and become Guerrillas! Given to the best Guerrilla (the one who plays the most games)-only available for 2nd and 3rd month. Participation Prizes are awarded for playing games of Kill Team in the Store. Given to customers who are involved in the campaign each week! 1: Decisive Strike 5: Decisive Shot 9: Up and at ‘em! These cards are given to customers to track their Kill Team instore after they have filled in their first card and are used in month 2 and 3. You will notice that on the back of these cards are four boxes for month 2 and four boxes for month 3 that show what is required to receive the following participation awards. Must complete 4 games with a team to earn the veteran card! Must play 4 games to earn 4 stamps on Veteran Campaign Card. That is a total of 8 games. You can start in any month but must play the 8 games to catch up! Must play 8 games to earn 8 stamps on Veteran Campaign Card. That is a total of 12 games. You can start in any month but must play the 12 games to catch up!